Cut sweet potato in half. Using a sharp vegetable peeler, peel flesh of sweet potato to create “ribbons”; continuing peeling until you have “peeled” all of the sweet potato. Remove to a bowl. Repeat with the cheese, creating long ribbons off the block; set aside. To sweet potatoes, add olive oil, salt and pepper; toss to coat. In a heavy-duty sauté pan over medium heat, add sweet potatoes; stir as they cook. To the pan, add butter; continue cooking until crisp tender. Don’t overcook sweet potatoes or they will stick to the pan and get mushy. Remove sweet potatoes to a plate. 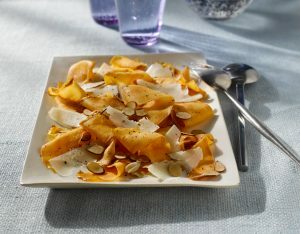 Immediately top with cheese and almonds. The heat of the sweet potato sauté will warm the cheese. Eat immediately.